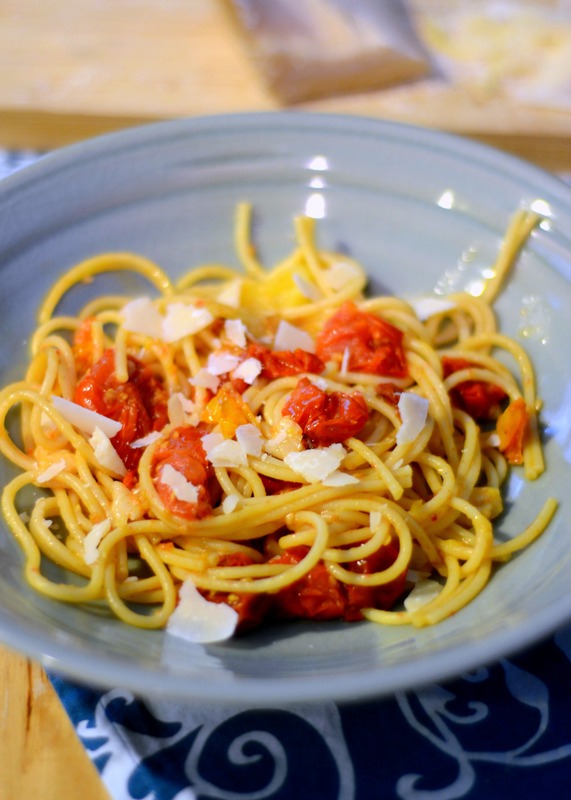 Looking for a quick meal that is warm and comforting too? 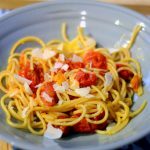 Look no further than this roasted fresh tomato Parmesan pasta! Even though right now, Florida is in the middle of a cold front (YAY! Cold front = waves), it is the growing season here. The rest of the country is growing cabbage and kale but Florida is growing tomatoes, grapefruit, and strawberries. We have a TON of tomatoes growing on the one plant that Aaron grew. The plant is massive. It has grown to about ten feet tall and is loaded with these little fruits. He has been spending a lot of time with his plant, talking to it every day, it must be why it has grown so well. Not sure but it is pretty amazing. I am not a pasta fan but Nova loves pasta and begs for it daily. I usually try to resist her because I don’t think it is the healthiest choice. BUT, it is better than a stop at Chic Fil’A so I indulge her. We had a bunch of fresh picked tomatoes asking to be used so I threw something simple together for her. Seriously, this was the quickest thing to pull together.I roasted the tomatoes while the pasta was boiling and once the pasta was ready, I tossed the tomatoes and their juices with the pasta. I topped the whole thing with a healthy amount of shaved high quality Parmesan and added a sprinkling of Himalayan pink salt. She loved it so much that I have been making it for her weekly and am a bit worried that she will finish off all of the tomatoes herself since she wants to eat this constantly. 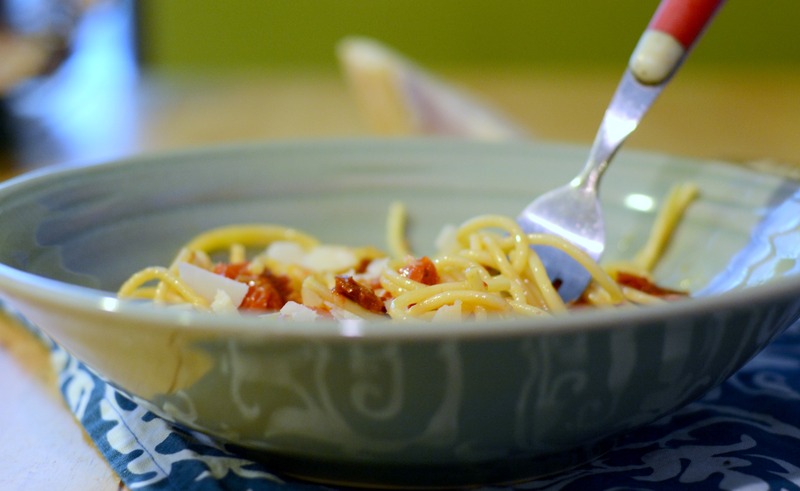 It really isn’t that difficult or time consuming to make dinner at home. Try something simple. 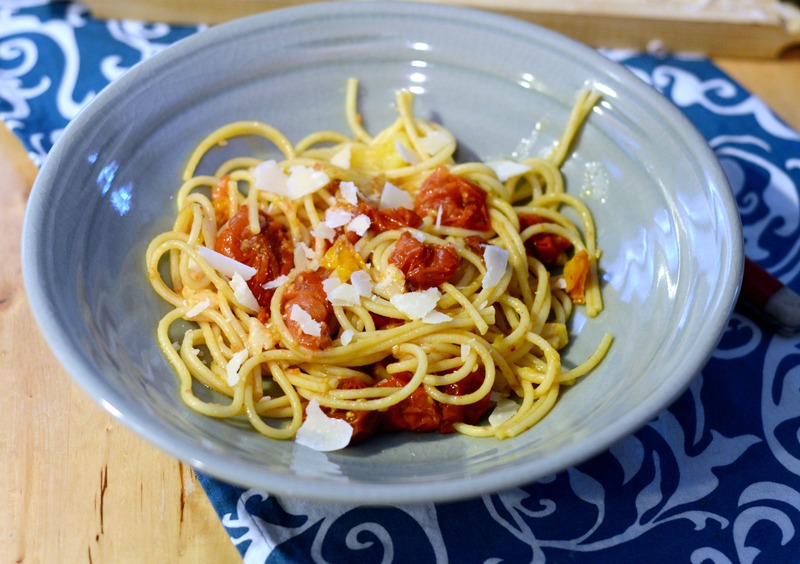 Even if you only have 15 minutes, you can get this roasted tomato Parmesan pasta on the table. Serve with a glass of wine to feel like you are dining out. Want to make it vegan? Omit the Parmesean and substitule with a vegan parm. I like this one.